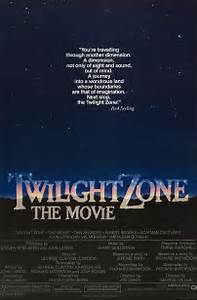 Rod Serling’s revered TV half-hour anthology The Twilight Zone, aired originally from 1959 to 1965, told different sci-fi and fantasy-tinged morality plays each week. It’s long shadow inspired this Warner Brothers big-budget movie anthology that made its theatrical debut in 1983 – an era when the blockbuster box-office returns of George Lucas and Steven Spielberg fantasias led the entertainment rackets to lavishly remake, relaunch and reboot all the way-out properties they owned the rights to. Whether the studios “got it” or not. Three parts of the four installments in TWILIGHT ZONE – THE MOVIE remake favorite TZ episodes, but the first, directed by John Landis (hot after AN AMERICAN WEREWOLF IN LONDON) is an original. It's about a bigoted businessman (Vic Morrow), ranting about losing a job promotion to a Jew, who instantly finds himself cruelly knocked about the whole 20th century, suffering the same persecutions as blacks in the Jim Crow South, Jews in the Holocaust, and Indochinese during the Vietnam War. This was the featurette in which actor Morrow (and two child actors) died in an on-camera accident, perishing beneath a crashing helicopter while filming the Vietnam section. The horrific waste made even more disappointing by the segment itself, a one-note bashing of a nasty guy that feels like something whipped up by slumming liberal Hollywood film-school students. The second story has a magical visitor (Scatman Crothers) to an old-folks home giving the seniors a chance to start life over as six-year-olds - if they want to. Steven Spielberg directed in a gentle and unusually modest mien for the spectacle-inclined filmmaker. Still, it’s a so-so riff on golden-agers turning young that straightaway would be done so much better by Ron Howard in COCOON. Episodes seem to have been arranged to get better as they go along (which was smart). In the third, a stranger stumbles into the captive household of Anthony (Jeremy Licht), a cartoon-crazed kid with awesome psychic powers to make his every whim come true, but who isn't truly happy. Director Joe Dante – admittedly abetted by an f/x budget that Rod Serling could never have dreamed of – turns the nightmarish TV entry (and creepy Jerome Bixby source short-story) “It’s a Good Life” into something sardonic, upbeat, fresh, and yet close to the Serling tradition. In George Miller’s finale, a computer scientist with a crippling fear of flying (John Lithgow, taking a role famously done on the small screen by young William Shatner) is on a storm-tossed airliner when he sees a sadistic monster gremlin outside, seemingly tearing up the wing. It comes on like gangbusters, and is also a textbook example of a showy filmmaker getting every last ounce of excitement out of a confined space (though Hitchcock still did it better in LIFEBOAT and REAR WINDOW). There’s an awkward framing device (guest starring Albert Brooks and Dan Aykroyd) which recurs, for little more reason than to remind what a haphazard construct the whole feature is…And that Aykroyd can do a killer Rod Serling impression…but only on Saturday Night Live, not here. What gives? Despite the lukewarm results, as a marketing device the feature coincided with the launch of a horror-fiction magazine dedicated to The Twilight Zone, plus an attempted revival of the TV show. Neither lasted very long. Neither did Amazing Stories, a 1985 attempt by none other than Spielberg himself to do a Serling-like anthology series, under various big-name Hollywood directors (an incredible assembly that included Martin Scorsese, Clint Eastwood, Tobe Hooper and A CHRISTMAS STORY’s Bob Clark). Some of those, I’m given to understand, were even quite interesting and outstanding.